The next meeting of the Elephant Amenity Network will be on 7pm Tues 18 Sept 2018 Bingo Room, 3rd Floor, Elephant and Castle Shopping Centre. You will know by now that the shopping centre planning application has been approved, by a very narrow margin. However there is still some distance to go before the development goes forward and the Mayor of London still has to give his endorsement to Southwark’s decision. We are campaigning now to get the Mayor to refuse to do this, as he has the power to do. We have now sent a joint open letter to the Mayor asking him to call the application in and improve the offer or direct a refusal. Eight Labour Councillors, including the local ward councillors and the deputy leader, have made their dissatisfaction with the decision clear and have also asked London mayor Sadiq Khan to make improvements. London Assembly member Florence Eshalomi and a local Labour ward has added their voices to the call. 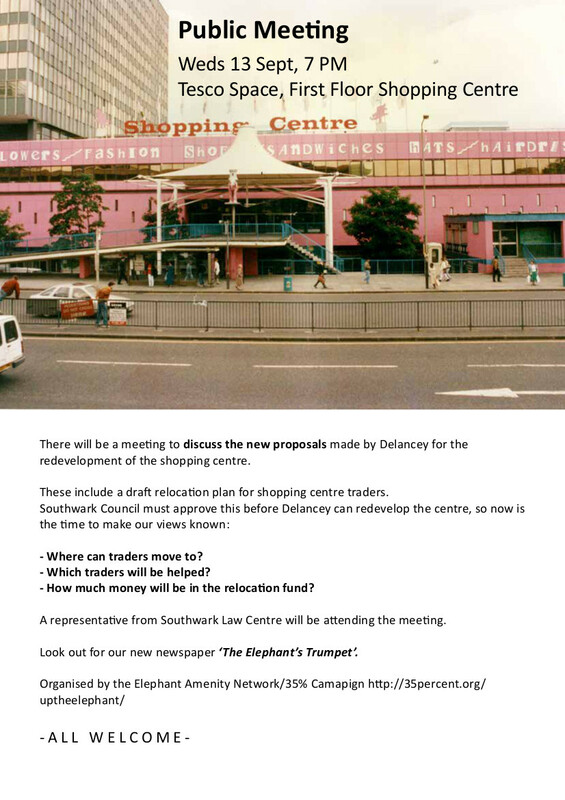 Despite being approved by the planning committee there is growing opposition to the Elephant and Castle shopping centre scheme. The scheme must be approved by Mayor Sadiq Khan and a NEW petition organised by Latin Elephant is calling on him to either direct refusal of the application or take it over himself. Southwark Defend Council Housing had a stall at the SGTO summer fest in Camberwell yesterday and got a good response to the campaign to stop the scheme. Labour Party branches and Camberwell and Peckham Constituency Labour Party have also demanded that Mayor Sadiq Khan calls this application in. You can see the motion they passed here. Green AM Sian Berry has also written to the Mayor, as have ward Councillors. PLEASE sign the online petition here. You will know by now that the shopping centre planning application has been approved, by a very narrow margin. However there is still some distance to go before the development goes forward and the Mayor of London had to give his endorsement to Southwark’s decision. We are campaigning now to get the Mayor to refuse to do this, as he has the power to do, and this will be the main item on the agenda of our next meeting, which will be will be next Tues 17 July 2018, 7pm, Bingo room, Palaces Bingo, 3rd Floor shopping centre. Please bring the attached invite. Stand Up for the Elephant protest! outside Elephant shopping Centre, top of the slope opposite Charlie Chaplin pub. No social cleansing, no community stitch up! We will also be leafletting the local area 4pm-7pm, Sunday 17 June, outside Elephant shopping Centre, top of the slope opposite Charlie Chaplin pub. 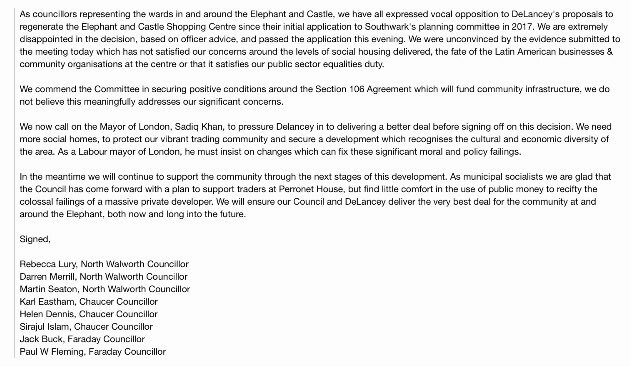 Up the Elephant is supported by Stop the Elephant Development, Latin Elephant, Elephant Amenity Network, Southwark Defend Council Housing, Occupy Elephant, and Southwark Notes.